New enhancements to the Otus Data Management platform allow for teachers and school leaders to efficiently analyze and act on both third-party data and data generated through the use of the Otus Student Performance Platform. A view of a customizable data dashboard in Otus. Educators across the country are being asked to use student performance data to inform decisions and to provide more meaningful learning experiences for students. 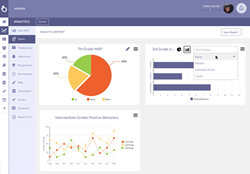 Otus, the creators of the award-winning K-12 student performance platform, today announced the upcoming release of a redesigned data management platform for users. While Otus has previously offered users the ability to view third-party data directly within the system, this summer’s release will offer many more ways to analyze and report data for district-level decision making. Currently, educators are being required to use many disconnected systems to manage their classrooms. Most commonly, classroom and learning management systems are disconnected from third-party student performance data which results in an inability to leverage edtech to efficiently differentiate and personalize student learning experiences using data. "Educators across the country are being asked to use student performance data to inform decisions and to provide more meaningful learning experiences for students," said Dr. John Hutton, Superintendent of Gurnee School District 56 (Gurnee 56 is the recipient of the 2017 ISTE Distinguished District Award). Otus allows educators and school leaders to analyze and act on any State assessment data (i.e. PARCC, Georgia Milestones, STAAR, etc.) and any district-level assessment data (i.e. NWEA, AIMSWeb, ACCESS, etc.). The Otus K-12 Data Management platform is fully integrated with both the Otus K-12 Classroom and Learning Management System and the Otus K-12 Assessment Management platform. “Quite frankly, school systems are telling us that the disconnectedness that exists within edtech is putting a heavy burden on their teachers, students, school leaders, and families, especially when it comes to making sense of all of the assessment data that is given to teachers and school leaders,” said Dr. Keith Westman, COO of Otus. "As a company full of lifelong K-12 educators, we are simply easing this burden- one that we experienced ourselves." "A platform that provides a more efficient connection between data and action is critical," stated Dr. Colleen M. Pacette, Assistant Superintendent of Curriculum and Assessment in Gurnee School District 56. The all-new Otus K-12 Data Management tools are already being beta tested in select school systems and will be available to all clients in July 2017. Otus is based in the West Loop neighborhood of Chicago at 1K Fulton, also home to Google's Chicago headquarters, and is dedicated to transforming how school systems use edtech to understand student performance. Otus provides the Otus Student Performance Platform, an integrated system that allows for a with three primary components- a Classroom and Learning Management System, an Assessment Platform, and a Data Warehouse- to school systems throughout the United States and Canada. To learn more about the Otus K-12 Data Management solution, or the entire Otus Student Performance Platform, visit http://www.otus.com.